Within the past decade, coaches and group or meeting facilitators have been engaged with increasing frequency in virtual environments — usually telephone or videoconferences. For groups, remote facilitation — when identified as such — is usually synchronous. That is, it occurs in real time over the telephone or a video link. An air traffic controller using a display system at an Air Route Traffic Control Center, one of the 22 such facilities that guide air traffic between airports in the U.S. Of all distributed "meetings," one of the most difficult to manage is the global air traffic control network. 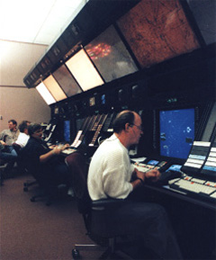 In the U.S., en-route traffic is handled by controllers located in groups at 22 Air Route Traffic Control Centers (ARTCCs). The busiest of these (probably because of its location) is Cleveland ARTCC, call sign "Cleveland Center." The geometry of these meetings, "facilitated" by controllers, is hub-and-spoke — that is, each "attendee" (pilot of a controlled aircraft) speaks with the controller, and no pilot ever addresses another pilot. It's especially important that these communications proceed without error, because mistakes can cost lives. This error-free communication must occur between people who probably don't know each other, using a communication link that's noisy and of quality lower than most telephone connections. For these reasons, each exchange follows a strict protocol that defines how people identify each other, and which requires confirmation of the information exchanged. You can listen live to this traffic at LiveATC.net. See if you can figure out details of the protocol for participation in this "distributed meeting." Photo courtesy U.S. Federal Aviation Administration. By contrast, asynchronous facilitation has been widespread for several decades. In the context of email distribution lists, we call it "moderating," though facilitation is now also emerging in chat and wiki contexts. Remote facilitation in asynchronous contexts will be a topic for another time. For now, let's consider synchronous contexts: the telephone and videoconference. Remote facilitation (or distance facilitation) of synchronous groups requires a skill set that overlaps, but is distinct from, the skill set of a face-to-face (F2F) facilitator. The differences vary with the process the group is using, but here are some of the differences for general discussions. Let's begin with issues that arise before the meeting begins. In face-to-face meetings, everyone is in the same room. The ability to participate is fairly uniform across the attendees. In virtual meetings, some might be "phoned in" while others are face-to-face. There might be several meeting sites conferenced together, or everyone might have called in to a bridge line. Geometries in which everyone has roughly equal access to the facilitator are symmetric; the others are asymmetric. Managing asymmetry requires special skill. Less effective access to the flow of the meeting tends to hinder contribution and enhance the temptation of distractions. The facilitator of an asymmetric meeting can take two actions to mitigate these risks. First, educate all attendees about the issue and ask for proactive cooperation of geometrically advantaged attendees to reduce the effect of meeting asymmetry by listening for attempts to participate, leaving space for those with less access, and even asking for their opinions and perspectives directly. Second, the facilitator can make a special effort to check in with the geometrically disadvantaged. of distractionsIn the F2F context, materials distribution is relatively simple. In the distributed context, network interruptions, security concerns, time zone disparities, priority differentials and uncontrolled distractions all conspire to create a need to distribute materials much sooner than we would in the F2F context. Make sure that materials are distributed early enough for your particular environment. Require acknowledgment of receipt. If materials don't arrive in time, or if you don't receive an acknowledgment, be prepared to cancel the meeting. If the materials don't arrive, or the acknowledgments don't arrive, and if you're reluctant to cancel the meeting, then ask yourself: (1) Were those materials really necessary? or (2) Were those attendees really necessary? If the answers are in the affirmative, a postponement is probably the right choice. For suggestions for facilitating highly charged distributed meetings, see "Remote Facilitation in Synchronous Contexts: II," Point Lookout for April 2, 2008. For suggestions for making remote facilitation easier using protocols defined for everyone in advance, see "Remote Facilitation in Synchronous Contexts: III," Point Lookout for April 9, 2008. Would you like to see your comments posted here? rbrencJfVQSXvRAYsmEDdner@ChacmqKyfzOOVtHGWTkXoCanyon.comSend me your comments by email, or by Web form. As practiced in most organizations, performance reviews, especially annual performance reviews, are toxic both to the organization and its people. A commonly used tool, the checkoff, is especially deceptive. I offer email and telephone coaching at both corporate and individual rates. Contact Rick for details at rbrencARAYwDlUasrEyDPner@ChacQXESEcSVzBkgBIInoCanyon.com or (650) 787-6475, or toll-free in the continental US at (866) 378-5470.